A protein and fiber-filled dessert that fills you up without all the guilt. Preheat oven to 375°. Prepare a muffin tin by coating 15 cups with cooking spray. Do not insert paper liners, the cupcakes will not rise properly. For the frosting: In a medium saucepan, combine the pumpkin, apple juice, brown sugar and pumpkin pie spice. Simmer for 30 minutes, or until thickened to the consistency of pumpkin butter. Stir in lemon juice. Allow to cool to room temperature. For the cupcakes: In a blender, grind the oats to a flour. Pour into a medium bowl and reserve. In the same blender, combine the quinoa, buttermilk, eggs, melted butter, coconut oil and vanilla. Blend on highest setting until the mixture is thick and smooth (about 4-5 minutes). In the bowl with the oat flour, add the sugar, baking powder, baking soda, salt and cinnamon. Stir to combine. Fold in the quinoa mixture. Fill each muffin cup 2/3 full. 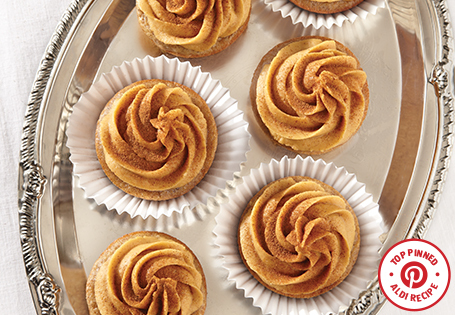 Bake for 13-15 minutes or until the edges are golden and the cupcakes are firm to the touch. Cool for 5 minutes before carefully removing from pan. Allow to cool completely on a wire rack. In a medium bowl, beat the cooled pumpkin mixture and butter until smooth. Add powdered sugar until spreading consistency is achieved. TIP: Make your own buttermilk by mixing ½ cup whole milk and 1½ teaspoon white vinegar. Allow to sit for 5 minutes before use.